The Minnesota Lease Termination Letter Form | 30-Day Notice fulfills a non-negotiable requisite of Statute 504B.135 by providing a useable form letter. When a Landlord or Tenant wishes to terminate an At-Will or Month-to-Month lease, whichever party is leaving must issue a notice so that it is received by the opposite party by a period of time that is equivalent or greater than an interval between rent payments. This period may not be longer than three months. For example, if the time period between rent payments is six months, the Tenant or Landlord may simply issue a three-month notice. Thus, whichever the lesser of rent intervals or three months is the notice required to be given. Such a requirement acts as a precaution to protect the recipient of such a notice from hardships that may be devastating otherwise. When utilizing this form letter as a measure to be compliant with Minnesota Law, make sure to consult the lease itself as any agreement in terms of delivery must be obeyed (unless it is unlawful). This will ensure a smooth transition for all parties involved. Step 1 – Place a mark in the box next to the first paragraph indicating the sender is the Landlord. Step 2 – In the first three blank spaces of the first paragraph enter the Calendar Date of the Lease being terminated (Day, Month, Year). Step 3 – In the last three blank spaces of the first paragraph, enter the desired Calendar Date of Termination for this agreement (Day, Month, Year). NOTE: This letter is appropriate for Month-to-Month and Week-to-Week At-Will Tenancies. Step 4 – At the bottom of the page will be two blank spaces. The first is for your signature while the second is for your printed name. Sign and print your name on these blank spaces. Step 1 – Locate the second paragraph then mark the box next to it. This will confirm your role as a Tenant who is terminating a lease. Step 2 – In the second paragraph, enter the date on the Lease you wish to terminate in the first three blank lines (Day, Month, Year). 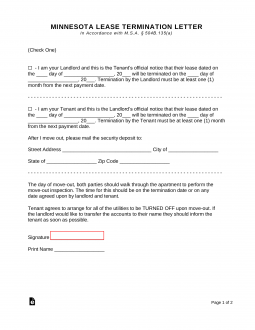 Step 3 – In the second paragraph, enter the desired date of termination for the lease you wish to end on the last three blank lines (Day, Month, Year). Note: The form letter is appropriate for Month-to-Month and Week-to-Week At-Will Tenancies. Step 4 – Locate the third paragraph (beginning with the words “After I move-out”), and enter the address where you may receive your security deposit or any notices regarding this on the four blank spaces (Street Address, City, State, and Zip Code). Step 5 – At the bottom of the page is a line labeled “Signature.” Sign your name on this line. Below this will be another line labeled “Print Name.” Print your name here.